Lay it down at the Manger Bed! Merry Christmas! This will be my last devotional for the year. But this is important, so stick with me. I've been thinking a lot about Christmas over the past week…and I was thinking, besides all the presents, decorations, etc., Christmas is really one of the most stressful and depressing times of the year for a lot of people. Do you know why? 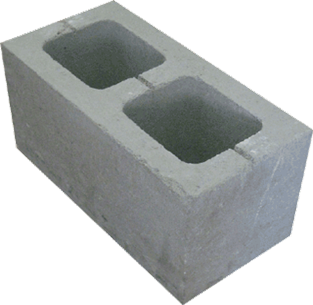 Ever see a Cinder Block? I have one in my office to remind me of some important heart issues: unresolved conflict, relational breakdown, family arguments, personal grudges. You see, I was thinking if a grudge was something physical, what would it look like? What would it feel like? How would you convey it if it was a tangible thing? So, that Cinder Block, that's a grudge. We all have things like this that we carry around. In fact, we have pretty interesting language about these things. We talk about them the way that we talk about babies: you can hold a grudge; you can carry a grudge; you can bear a grudge; you can nurse a grudge. Yes, you can actually feed it with real hostile thoughts, angry feelings, distorted perceptions, hostile intentions, and if you do that, I guarantee you, your grudge will grow. The tragic thing about this stuff is that people will walk around and carry one of these for weeks or months or years. Now, you think about it for a minute for it is kind of ridiculous to carry things like grudges around. If your living metaphor is a Cinder Block, I mean, these things weigh you down. Overtime they are joyless. I don't think I've ever heard anybody say to herself or himself, "I can't wait to get up this morning and pick up my grudge and carry it all through the day. This is going to be a tremendous day, me and my grudge." Nobody says that, but, trust me, people do it everyday. "When I was young, I occasionally heard tales of sisters who hadn't spoken to each other in years, or of a father who hadn't talked to his son in decades. Back then those stories were a mystery to me. How could anyone reject a member of their family? Family meant love and loyalty, and loyalty meant you never let a fight escalate into a feud. The author goes on to talk about one feud that has become quite public. Has any of you ever read "Ann Landers" and "Dear Abby"? These were twin sisters who for many, many, many years wouldn't speak to each other because of unresolved conflict. Now, one of them has died, the other one has Alzheimer's. Their daughters, who were both attempting to take over their mom's columns, are also carrying on their mother's feuds because grudges sometimes get passed down from one generation to another. One of them has accused the other one of exploiting her mom's death for success and for money. This is amazingly ironic to me. For decades and decades, the two people in our country who get more letters asking for relational advice on how to fix relationships than anybody else, the two who get asked that advice the most, are family members who don't speak to each other now for two generations." Does this sound familiar in anyway? You know how it is…broken relationships happen. They happen between family members, people who work together, people who are friends….sometimes the hurts go so deep that people avoid each other and don't talk for weeks even years. For all of us, we've heard the stories…for some of us, we've written the stories. Well, how about this for a pre-Christmas preemptive strike today-wouldn't it bring God incredible glory if we could do something about this? I believe it would….so for next few minutes, read on. In the New Testament Jesus tells a story to drive home how serious he was about forgiveness. See Matthew 18. I don't have space in this devotional to completely reiterate the story so let me cut to the chase and simply tell you the amazing and bodacious words that Jesus said at the conclusion of the story. Here they are. Fasten your seat belt because the story ends with an unforgiving person being put in jail, experiencing judgment for his unforgiving spirit. Jesus then says, "This is how my heavenly Father will treat each of you unless you forgive your brother from your heart (Matthew 18:35)." I just want to stop for a moment…let those words sink in. These are what I think are some of the most sobering words in the Bible. There's a whole lot of people–and to tell you the truth, sometimes people in churches–who live as if Jesus didn't really say this; as if Jesus didn't really mean this." I think those are some of the scariest words in the Bible. Jesus says, to us all that if we're walking around with unresolved bitterness and resentment, and we refuse to do the work of forgiveness and to seek reconciliation with other people, we're at severe spiritual risk. I'll tell you what I think. I think the only thing that allows one human being to withhold forgiveness from somebody else, to walk around carrying a grudge, is when they forget, or when they live in a kind of denial of the infinitely greater amount of forgiveness that they need and receive from God. Let me put it this way…my forgiveness and your forgiveness comes at the cost of the cross. It came at the price of the death of God's Son. The cost of our forgiveness to God was monumental. It cost him the life of his Son to forgive me and to forgive you. Therefore, there is only one safe place to put a grudge, and that place is at the foot of the cross. Or, because I want to put a Christmas spin on this…the only safe place to put one of these is at the foot of the manger. The wise men brought their gifts, gold, frankincense and myrrh. But the greatest gift you can give Jesus is the boulder you're carrying around that prevents you from experiencing freedom in your heart. I'm wondering today, whatever stone you're carrying around, would you be willing today to lay it at the foot of the manger in Bethlehem? Whatever your hurt and your bitterness is, would you be willing to lay it down and remember again the price that was paid for your forgiveness and for mine? Consider this – when people live in the shadow of Christmas, they don't carry stones. When people live in the daily awareness of what God did for them, when people know the lavishness of God's mercy and grace, why would you carry your stone? Why would you dare? Here's the truth friends…we all have relationships where there have been wounds…no matter who said what or who caused what, you were wounded to the core. Inside you you're saying, "There's no way….I'm not going to let them get away with that…Set that stone down? Give them a free pass? no way." I want to tell you something. Life is too short. Many of you have been carrying around that stone for a long time. Set it down. It's Christmas time! There is no miracle in the world like the miracle of forgiveness. There is none. I tell you this without apology. There is no miracle in the world like it. You can carry your stone/block to the grave, but I hope you don't because life is too short, and it will kill you. I don't know how badly you've been hurt. I know some of you have been hurt really badly, in some cases over a long period of time. I hope you'll forgive. This is what we'll do…let's lay down some grudges at the foot of the manger this Christmas. I'll do it if you will. If you need help get help. The best book I know on the subject of forgiveness is a book called "Forgive and Forget" by a man named Lew Smedes, or "What's so amazing about Grace" by Phillip Yancey. If you need to talk to a good Christian counselor, talk to a good Christian counselor. If you need to make a phone call, Jesus says make it right now. If you need to write a note, write it today. Post that private Facebook message. Maybe you just need to go to a door that's been closed for a long time and knock on the door. Well, go there and knock. Do it today. Maybe it will take a lot of time and a lot of effort and a lot of persistence, a lot of wisdom, a lot of counsel. Because just to forgive someone can be quite a difficult thing, and then to seek reconciliation–that's a two-way deal. That requires two people. That's harder yet. Maybe it will take a lot of time and a lot of work and a lot of effort and lot of prayer. Then give it a lot of time and a lot of work and a lot of effort and a lot of prayer. There is no miracle like the miracle of forgiveness. If you're a follower of Jesus, if you love God, you've been forgiven an infinite debt. You have been cleansed of the ultimate stain. What God has given you, you've got to give it. See the manger bed? You know what you need to do! Since I entered the churchworld as a full-time worker and leader, I have been involved in more Christmas worship experiences that I care to count. In some of the churches, we had two services. At others, up to Seven. It doesn't matter how often or even what "style" of worship on which we worship, Christmas Eve is still one of the highlights of the year. Not only are we looking at the REAL meaning of what Christmas is about, but we are doing it in ways that inspire, convict, inspire focus and a growing heart and soul of love! 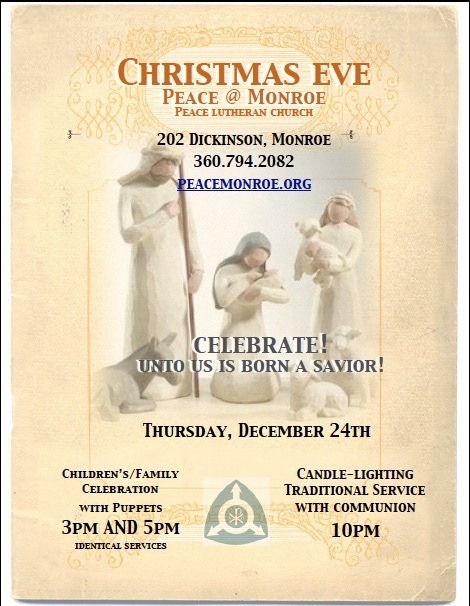 If you are anywhere near Monroe, Washington, please know that you are sincerely invited to join my faith community for Christmas Eve. If not, follow the Spirit to your own celebration. You won't regret it! What about gift giving? How did that become a part of Christmas? The truth of history is that gift giving is one of the oldest traditions associated with Christmas. Some people actually believe that it is older than the holiday itself. The Romans, for example, celebrated the Saturnalia on December 17. It was a winter feast of merrymaking and gift exchanging. And two weeks later, on the Roman New Year–January 1, houses were decorated with greenery and lights, and gifts were given to children and the poor. As the Germanic tribes of Europe accepted Christianity and began to celebrate Christmas, they also gave gifts. In some countries, such as Italy and Spain, children traditionally do not receive gifts on December 25 but on January 5, the eve of Epiphany. In several northern European nations gifts are given on December 6, which is the feast of St. Nicholas, the patron saint of children. Yet, you have to remember, gifts were given the moment the newborn Savior was born. The Magi bought gold, frankisense and myrrh. The Shepherds brought their hearts in prayer and praise. The angels gave praise to the King as well. There are some things you should know about trees and decorations. Ancient, pre-Christian winter festivals used greenery, lights, and fires to symbolize life and warmth in the midst of cold and darkness. The use of evergreens and wreaths were symbols of life and aspects of a wide-array of ancient cultures.. Tree worship was a common feature of religion among the Teutonic and Scandinavian peoples of northern Europe before their conversion to Christianity. They decorated houses and barns with evergreens at the New Year to scare away demons, and they often set up trees for the birds in winter. I’ve been putting up trees for years and there are still “demons” (usually in the form of teenagers) that haunt my house. The modern Christmas tree seems to have originated in Germany during the Middle Ages. The tree was the main prop in a medieval play about Adam and Eve. The “tree of the knowledge of good and evil” was a fir tree hung with apples. In these plays, the tree was called the "Paradise tree," and it represented the Garden of Eden. German families set up a Paradise tree in their homes on December 24, the feast day of Adam and Eve. On it they hung wafers, symbolizing the bread distributed at the celebration of the Eucharist in churches. Because the Christmas holiday followed immediately, candles representing Christ as the light of the world were often added to the tree. Eventually cookies and other sweets were hung instead of wafers. The Christmas tree was introduced into England early in the 19th century, and it was popularized by Prince Albert, the German husband of Queen Victoria. The trees were decorated with candles, candies, paper chains, and fancy cakes that were hung from the branches on ribbons. German settlers brought the Christmas tree custom to the American colonies in the 17th century. The use of evergreens for wreaths and other decorations arose in northern Europe. Italy, Spain, and some other nations use flowers instead. Holly, with its prickly leaves and red berries, came into holiday use because it reminded people of the crown of thorns worn by Jesus on the way to his execution–the berries symbolizing droplets of blood. Two hundred years before the birth of Christ, the Druids in the pagan side of Celtic culture (British Isles) used mistletoe to celebrate the coming of winter. They would gather this evergreen plant that is parasitic upon other trees and used it to decorate their homes. They believed the plant had special healing powers for everything from female infertility to poison ingestion. Scandinavians also thought of mistletoe as a plant of peace and harmony. They associated mistletoe with their goddess of love, Frigga. The custom of kissing under the mistletoe probably derived from this belief. The early church banned the use of mistletoe in Christmas celebrations because of its pagan origins. Instead, church fathers suggested the use of holly as an appropriate substitute for Christmas greenery. How about the Manger scene? This is interesting – a custom originated in southern Europe centuries ago where people erected what was often referred to by its French name, a crèche. This is a small model of the stable where Jesus was born, containing figures of Mary, Joseph, the infant, shepherds, farm animals, and the three wise men and their gifts. The custom is said to have been started by St. Francis of Assisi. On a Christmas Eve in 1224 he is supposed to have set up a stable in a corner of a church in his native village with real persons and animals to represent those of the first Christmas. When it comes to the celebration of Christmas, history tells us some more provocative truths. In ancient times, the last day of winter in the Northern Hemisphere was celebrated as the night that the Great Mother Goddess gives birth to the baby Sun God. It was also called “Yule”, the day in which a huge log is added to a bonfire around which everyone would dance and sing to awaken the sun from its long winter sleep. In Roman times, the Yule party became something that honored Saturnus (the harvest god) and Mithras (the ancient god of light). Essentially, the celebration had morphed into a form of sun worship that had originated from Syria a century before with the cult of Sol Invictus. These festivities announced that winter was not forever, that life continues, and was a yearly invitation for people to stay in good spirit. The last day of winter in the Northern Hemisphere occurs between the 20th and 22 December. The Roman celebrated Saturnalia between 17 and 24 December. As Christianity emerged into the Roman culture, Christmas as we know it started to take shape. To avoid persecution during the Roman pagan festivals, early Christians decorated their homes with Saturnalia holly. As Christians increased in numbers and in influence, their customs prevailed and the ancient festivals started to take on a distinctly “Christian” feel. Something you should know – the early church actually did not celebrate the birth of Christ in December. It wasn’t until Telesphorus, who was the second Bishop of Rome from 125 to 136AD, declared that Church services should be held during this time to celebrate "The Nativity of our Lord and Savior." However, since no one was quite sure in which month Christ was born, in the earliest of celebrations, the Nativity was often held in September (which was during the Jewish Feast of Trumpets, modern-day Rosh Hashanah). In fact, for more than 300 years, people observed the birth of Jesus on a wide variety of dates. It wasn’t until the year 274 AD, when the winter solstice fell on 25th December, that the Roman Emperor Aurelian proclaimed the date as "Natalis Solis Invicti," the festival of the birth of the invincible sun. That gave occasion for the Church to act. In 320 AD, Pope Julius I specified the 25th of December as the official date of the birth of Jesus Christ. It became official but still not generally observed. It wasn’t until 325AD that Constantine introduced Christmas as an immovable feast on 25 December. He also introduced Sunday as a holy day in a new 7-day week, and introduced other movable feasts days (e.g Pentecost, Easter, etc.). In 354AD, Bishop Liberius of Rome officially ordered his members to celebrate the birth of Jesus on 25 December. However, even though Constantine officiated 25 December as the birthday of Christ, Christians, recognizing the date as a pagan festival, did not share in the emperor's good spin on things. Because of that, Christmas failed to gain universal recognition among Christians until only recently (of course, this is relative given the span of history). Even in “religious” England, Oliver Cromwell banned Christmas festivities between 1649 and 1660 through the so-called Blue Laws, believing that Christmas should be a solemn day not associated with paganism. Christmas “took” when many Protestants escaped persecution by fleeing to the colonies all over the world. It was only then that interest in a joyous Christmas celebration was kindled. Still, Christmas was not even a legal holiday until the 1800s. The popularity of Christmas was spurred on in 1820 by Washington Irving's book The Keeping of Christmas at Bracebridge Hall. In 1834, Britain's Queen Victoria brought her German husband, Prince Albert, into Windsor Castle, introducing the tradition of the Christmas tree and carols that were held in Europe to the British Empire. A week before Christmas in 1834, Charles Dickens published A Christmas Carol (in which he wrote that Scrooge required Cratchit to work, and that the US Congress met on Christmas Day). That book became so popular that neither the churches nor the governments could further ignore the importance of Christmas celebrations. In 1836, Alabama became the first state in the US to declare Christmas a legal holiday. In 1837, T.H. Hervey's The Book of Christmas also became a best seller. In 1860, American illustrator Thomas Nast borrowed from the European stories about Saint Nicholas, the patron saint of children, to create Father Christmas (Santa Claus). In 1907, Oklahoma became the last US state to declare Christmas a legal holiday. Then it became a landslide across the world. Year by year, countries all over the globe started to recognize Christmas as the day for celebrating the birth of Jesus. And last but not least – Santa Claus! The original Santa Claus, St. Nicholas, was born in Turkey in the 4th century. He was a very pious and spiritually upright man who, from an early age, devoting his life to Christianity. He became widely known for his generosity to the poor. In other words, he was a Missional Christian! Even with his generous and loving heart, the Romans held him in contempt. He was imprisoned and tortured. When Constantine became emperor of Rome, he allowed Nicholas to go free. Constantine is said to have become a Christian (that can be debated in some instances) before his famous, “Edict of Milan” which proclaimed Christianity as the official religion of the empire. After that, he convened the Council of Nicaea in 325. Nicholas was a delegate to the council. He is especially noted for his love of children and for his generosity. He is also the patron saint of sailors, Sicily, Greece, and Russia. He is also, of course, the patron saint of children. The Dutch kept the legend of St. Nicholas alive. In 16th century Holland, Dutch children would place their wooden shoes by the hearth of a fireplace in hopes that they would be filled with a treat. The Dutch spelled St. Nicholas as Sint Nikolass, which became corrupted to Sinterklass, and finally, in Anglican, to Santa Claus. In 1822, Clement C. Moore composed his famous poem, "A Visit from St. Nick," which was later published as "The Night Before Christmas." Moore is credited with creating the modern image of Santa Claus as a jolly fat man in a red suit.